These photos are visually striking instantly taking your breath away leaving views in a unnerving state of unease. This gives of the impression that the building would have a metal taste in the air possibly from the rock like materials and the tools use to shape them. I also think that a slight salty taste would be ever so vaguely sprites through the particles in this old styled theatre. The smell would have to be one of earthy strong smells as the use of material over time must have dampened the entire area. I instantly sense the sounds of violent but soft violins echoing through the empty seats, and chilling piano rifts that give of the sense of loneliness and elegance. It gives of the depiction of spiky and it feels very edgy with the common design along the theatre that look like big icicles on a extremely cold day. As for the movement it would most defiantly be synchronized spinning amongst the elegant, huge pillars surrounding the theatre seats. Easily recognizable as Expressionism, as it it very haunting and give off conflicting emotions of being hauntingly beautiful. This perceptual phenomenon applies to Filippo Marinetti’s “At Night In Her Bed”. The father of Futurism, the goal of Marinetti’s work was to reject all that was traditional and celebrate urban culture and advanced technology. The Futurism movement wished to portray movement, speed, power and violence through a modern lens. 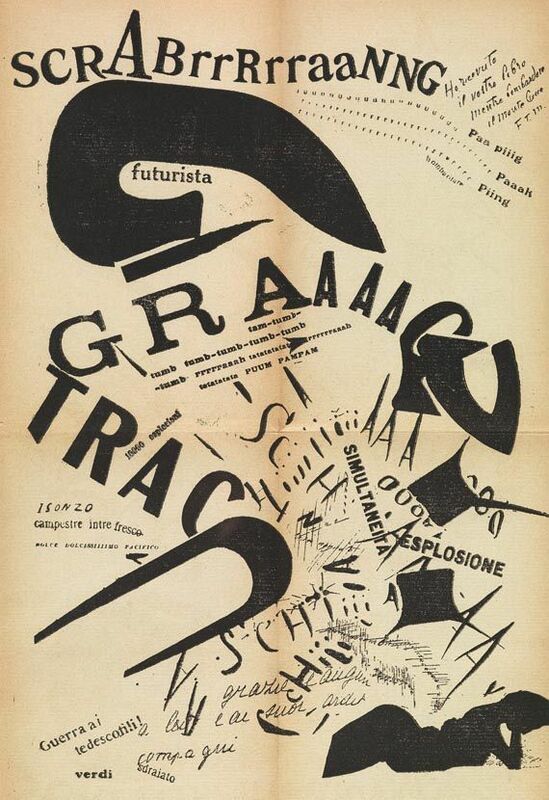 Marinetti’s main subjects/inspiration were the automobile and war, which represented all of these components. In “At Night In Her Bed”, Marinetti depicts how sound would look. He has created a visual frequency of the sounds, using elongated or large type to show us a particularly higher/louder sound compared to the sounds that are smaller, which we can assume are shorter or quieter. He is showing us a bombing that is keeping a woman awake at night. It is an allegory, because she is thinking of her partner who is on the front lines fighting in the war. She is awake because she is imagining the bombings. It is total chaos, we feel the anxiety the woman is experiencing through Marinetti’s jagged lines. There is an influence from the Vorticism movement in this piece; the text is exploding upwards in a circular motion away from the woman imagining it. This piece is unique where it has already aided me visually to experience synesthesia. It’s very illustrative with the text, which brings me to interpret the sound of a bomb. This particular piece offers a very euphoric and airy final product. It features lots of muted colours which evoke a more peaceful feeling. I find that this portrays a lot of movement. The way the clouds surround the figures makes them look very weightless and floating. They seem very effortless. This makes them feel like they’re not moving yet still somehow showing how flowy their movement is. The extending of the figure’s legs also help the eye move across the artwork creating a moving path for the eye. Touch also plays a big role in this painting. The way that the clouds are painted make them seem very fluffy and light. It makes me think of touching cotton candy and it definitely looks like it as well. The cloths that are on the figures also follow the same technique. They look soft especially the way that they fall against the skin of the figures. The folds in them make it seem almost luscious and delicate. The artwork as a whole portrays great movement and a sense of touch. The painting technique helps with the visual fluidity of all the elements. The placement and elongation of certain details allow for movement within the painting. When I look at the 1937 catalogue cover for Entarte Kunst (Degenerate Art), I immediately imagine the smell of smoke and decay. This is in part because of the dark palette of the image, as well as the rough, smoky texture of the 1912 Otto Freundlich sculpture Der Neue Mensch (The New Man) which is featured on the cover. The association, however, must also be in part due to the depressing implications behind this design. The fact that has always stuck with me about the “Degenerate Art” exhibition was that it was actually far better attended and more well-regarded than the concurrent “Great German Art Exhibition,” which was full instead of Hitler-approved works. That it should have been entirely clear to the Nazi regime that the works displayed in “Degenerate Art” were of true cultural significance and value makes it all the more tragic that these works were destroyed, censored and suppressed for years to come. I think this chaos and backwardness is what brings to mind the sensation of needless destruction. 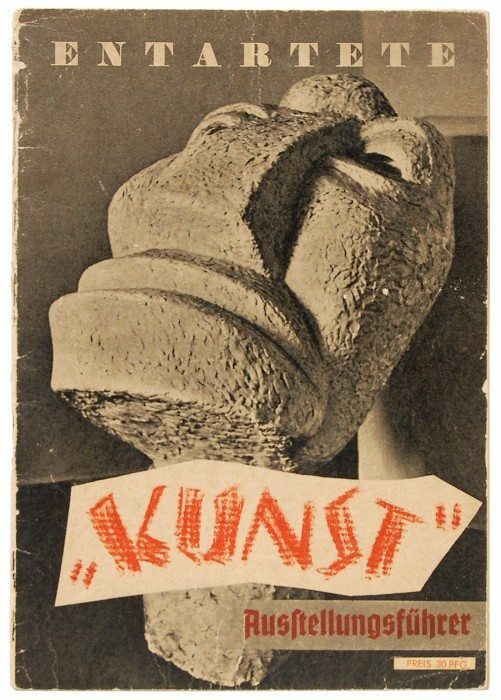 Anonymous, Entartete Kunst (Degenerate Art) catalogue cover, 1937. Features Otto Freundlich, Der Neue Mensch (The New Man), 1912. Eskilson, S. Graphic Design: A New History. Yale University Press, 2007. I have chosen to write a creative synesthesia on Milton Glaser’s “Bob Dylan” graphic design. When relating this illustration to sound it would be quite easy to say that it evokes Bob Dylan’s early career. Though I do feel that this illustration of Bob Dylan is reminiscent of the way the music that he created during the 1960s sounds, I would like to go a little broader and talk about why. When translating this illustration into sound it reminds me of the way that a small quiet room sounds like. The silhouette of Bob Dylan and the minimalist way his portrait was drawn is what evokes this. It reminds me of the sound of a clean, bright room with minimal amounts of furniture. As you are experiencing the sound of this room, maybe someone has turned on a stereo. Music is bursting from one corner of the room, flowing out of the speaker and entering your ears, eventually filling up the tiny space with colourful sounds. The sound is both experimental and pleasant. There are many layers and components to it, almost reminiscent of an orchestra but flow-ier and more wonky, less perfect. You can hear the dynamics and the play between the once silent room, now filling up with tremendous sound. This portrait is part of the psychedelic movement in art. During this movement artists wanted to create posters that made the viewer feel as if they were on psychedelic drugs. I wanted to relate music to this particular poster because, for one reason, music and psychedelic art go hand in hand, and two, because Bob Dylan is an extremely influential folk artist, who I would not champion as an extremely forefront figure in the psychedelic drug scene. This particular graphic design is a little different from typical psychedelic posters, as it utilises the space differently. Psychedelic posters tend to fill the entire page with colour and illustrative text and images that feel as if they are optical illusions. 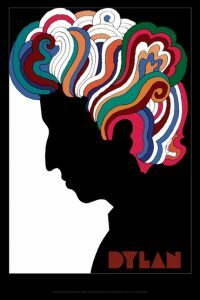 Milton Glaser’s image touches on the psychedelic style in a more minimalist way, due to the silhouetted portrait and the only touch of fluid colour flowing outwards as Bob Dylan’s hair. I think this image is reminiscent of the way that Bob Dylan could fill a quiet room with music, especially music from his protest song career in the 1960s. He could get an entire crowd of people to listen to him with songs that were musically simple, but with a strong and empowering message. This image also reminds me of the song “A Day in the Life” by the Beatles. The song starts off as if the Beatles are signing in a small room, with good acoustics and an echo, like a bathroom. As the song progresses it builds up to an explosion of sound, dynamic and constantly changing. The song is as layered as the colours in the image and flows into an encompassing sound in a way that is reminiscent of the illustration. The portrait of Bob Dylan created by Milton Glaser evokes the music of psychedelic artists of the 1960s. This illustration reminds the viewer of Bob Dylan’s folk career, especially of his career in the early 1960s when he became popular for his protest songs. Personally, this image reminds me of the song “A Day in the Life” by the Beatles because of its dynamics, contrast and booming layered sound. Bob Dylan. “Mr. Tambourine Man.” Bringing It All Back Home, Columbia Recording Studios, 1965. Glaser, Milton. “Bob Dylan.” Offset lithograph. 1966, Museum of Modern Art. The experience of ones sense can trigger the perception of other senses. This condition of a physical sensation evoking another is known as Synesthesia. I believe that this experience can be triggered in various works during the Art Nouveau Movement. Art Nouveau arose in the later part of the nineteenth century. 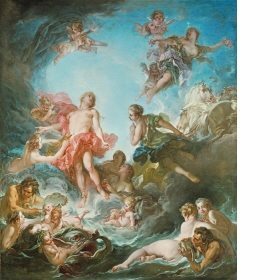 This period interests me because it is a reaction to the academic and strict art of the early 19th century. After the Industrial Revolution, designers and artists believed that Europe was lacking its beauty. Therefore, in unifying art and design together creative’s attempted to celebrate the vibrant urban life with fresh visuals and perspectives. Natural forms and structures, as seen in Cheret’s work, inspired many artists of this period. 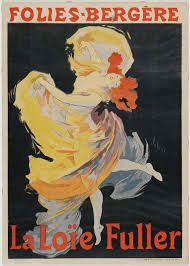 In 1893, Jules Cheret created the most influential poster of the century, La Loie Fuller. This poster advertised the Paris debut of the American dancer at the Folies-Bergère. I believe Cheret’s lively style matched the dancers performance perfectly as it was described. Inspired by the Japanese Art and Rococo style, Cheret captures the dancer’s natural movement, spinning on stage as her silk garments are shimmering in different colours. I especially admire how Cheret uses the attributes of the new art of graphic design in combining lettering with the image. When I look at this poster I immediately connected the composition with musical instruments. This connection could be made due to the figure’s movement. “Art Nouveau.” Wikipedia, Wikimedia Foundation, 16 Mar. 2018, en.wikipedia.org/wiki/Art_Nouveau. The concept of creative synesthesia occurs when individuals experience one physical sensation that evokes another with a sense; such as, tasting food with the use of imagery as someone explains it to you. 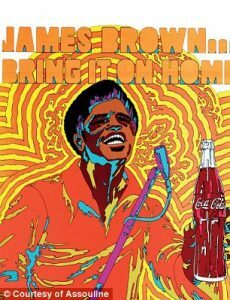 For this post, it will revolve around, the 1969 Coca Cola ad, where James Brown’s was featured, designer yet to be found. During this time, Coca Cola had changed their original slogan from, “Things Go Better with Coke to It’s the Real Thing”, during this switch James Brown had recorded a new song for the new slogan, which also landed him to be featured on the ad. For this composition, the undiscovered designer incorporated warm, citric colours that provide a bright, refreshing and summer-like feeling. Aside from the relation of the fizzyness in the beverage and the organic lines as the background, this particular colour palette, evokes the sensation of taste, as a burst of citric flavors come to mind. This pop art composition reminds me of the pop rock candies, where every mouth full provides you with a POP and a burst of new flavours. It displays a significant amount of happiness, which is clearly demonstrated on James Brown’s face, also, with the dominance of yellow, orange and golden yellow, the sensation of happiness and joy is greatly presented. 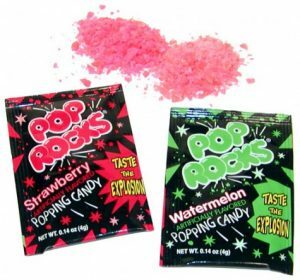 Pop rocks candy provides every consumer with a new burst of excitement as every taste is different. 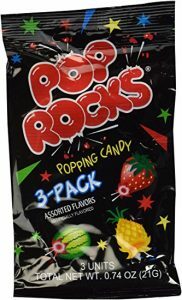 The small organic shapes included in this design around the ears and on small sections of the body represents the different shapes of the little pop rock candies that come inside of the packages, as they are all different sizes. The De Stijl design movement of the early 20th century emphasized reductive harmony above all, striving for a universal style that communicated on the most basic level. Similarly, the charcuterie board simplifies hand foods to their most essential, malleable forms, idealistically attempting to provide any number of possible food combinations to satisfy the greatest number of consumers. De Stijl sensibilities are also echoed in the charcuterie board’s aesthetic qualities, in the harmonious arrangement of simple component parts referencing the limited use of basic shape and colour in De Stijl works. And Finally, the charcuterie board shares also the idealistic failures of De Stijl, where the designers of the movement strived for universal and accessible communication, the work was found to be too avant-garde and difficult to understand the intention of. 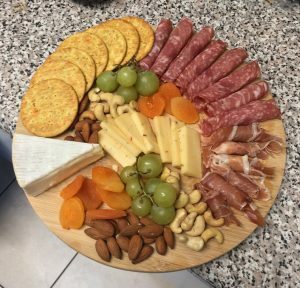 The charcuterie board also, though intended for easy snacking, has complicated the task of meal consumption, and potentially alienated those not familiar with the eclectic combination of food items. 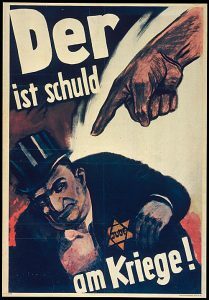 Der ist schuld am kreige “He Is Guilty for the War” or “He is to blame for the war” 1943 is an anti-Jewish poster by the artist “Mjolnir” intended to persuade Germans that Jews were responsible for starting the war. “Mjolnir” was the pen name of the artist Hans Schweitzer who created many of the most popular Nazi propaganda posters. Schweitzer becomes known for the quality and the vigor of his stroke, and his posters, caricatures, and drawings make him the most famous propagandist of the NSDAP. The colour for majority of his work have a darkness to them, he uses a lot of black, red and other neutrals. In this particular poster, he incorporates these colours to work harmoniously to bring depth and dimension to this piece as he emphasizes certain elements. He brings direction the type as well as the hand to focus on the person he created who is a Jew. The stereotypical Jew has attributes that Schweitzer has set through his posters, gathers all the negative aspects that people sought out Jews to be. If this were to be presented in another sense like sound, in my opinion, it would sound like house music. House music is electronic music that was created by club DJ’s in Chicago between 1975 – 1980. House music takes disco’s use of a prominent bass drum on every beat and developed a new style by mixing in a heavy electronic synthesizer bassline, electronic drums, electronic effects, funk and pop samples, and reverb- or delay-enhanced vocals. House music is a broad term and there are different kinds of “house music within its name, there are more subtle songs and then there are songs used in clubs like electro house music for example, that emphasize the reason I say house music. To me this kind of music is not what I think is considered to be music just like how I think Schweitzer’s poster is not what I portray Jew’s to be or the Nazis mentality behind who they think started the war. House music is known to be a strong/hard and there is a lot of tension within the music that can either make you feel liberated or uncomfortable. Similarly, how this poster has a very strong concept through the use of powerful colour and the composition itself creating tension between elements like the hand and the Jew, to the Nazis this was something that was liberating, presenting Jews the way they did and allowing the whole world to see it. The Jews however, were not only uncomfortable, that would be an understatement. Usually, house music has a sense of direction whether one may hear it or not, house music usually starts off by a subtle bass and escalates as other attributes are mixed within that first bass and finally it peaks and although there isn’t a peak with Schweitzer’s poster it still holds direction through the piece. I could’ve compared this to heavy metal but I wanted to show that house music although still serves a purpose in today’s society unlike heavy metal. through raves and clubs people tend to listen and enjoy this genre with Schweitzer, the poster served its purpose during its time, it helped the Nazis in a liberating way along with the other propaganda it helped them through the war. Meggs, Philip B., and Alston W. Purvis. Meggs’ History of Graphic Design. Wiley, 2016. Tibaski , Linol. “The Best House Music DJs of All Time.” Time Out New York, www.timeout.com/newyork/music/best-house-music-djs-of-all-time. Bainbridge, Luke. “Acid House and the Dawn of a Rave New World.” The Observer, Guardian News and Media, 23 Feb. 2014, www.theguardian.com/music/2014/feb/23/acid-house-dawn-rave-new-world. In the 1960s, the psychedelic art, especially psychedelic poster art took off in counter culture movement groups. Its style was heavily influenced by the effects of hallucinatory drugs, featuring bold swooping shapes, curvilinear lines and type and vibrating colours. Psychedelic poster designers were in close communication with many musicians of this time and are responsible for the majority of their album covers and concert posters, which leads us to the sound of this era. When listening to music from this time, it is easy to hear the correlation between many of the artists stylistic choices and the imagery of their posters. The extended guitar solos, complex riffs and experimentations with noise all evoke the same overwhelming hallucinatory feeling that the Psychedelic posters have as well. 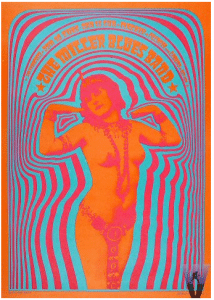 A key feature of the Psychedelic posters is their vibrating colours. This was achieved by choosing two colours directly across from each other on the colour wheel and using them with an equal value and intensity in the design. The colours then bounce off of each other and make the image appear like it is vibrating. This vibrating effect is clearly heard in Jimi Hendrix’s “Voodoo Child”. Right from the first riff you can hear how the final chord vibrates into the beginning of the pattern. As the song continues and more elements are added, the effects of these vibrations are exaggerated, creating an overwhelming soundscape that draws the listener in and leaves them in a trance like state. Listening to the song with closed eyes enhances these effects even more, allowing the brain to focus on the music and the sounds to control the other senses. With your eyes closed, you will be able to see waves of colour moving across your eyelids, following the sound waves of Hendrix’s guitar. Just like how if you were to stare at a psychedelic poster for a few minutes and then close your eyes, the colours of the image would still linger in your mind. When listening to songs like “Voodoo Child” it is practically impossible to not envision the posters accompanying them, which just goes to show how much the images sound like the songs.